With the current state of white out this winter, I am delighted to share a sneak peek at a fresh project full of color in House Beautiful. Lindsey Coral Harper is a young designer who knows how to put an updated spin on tradition. 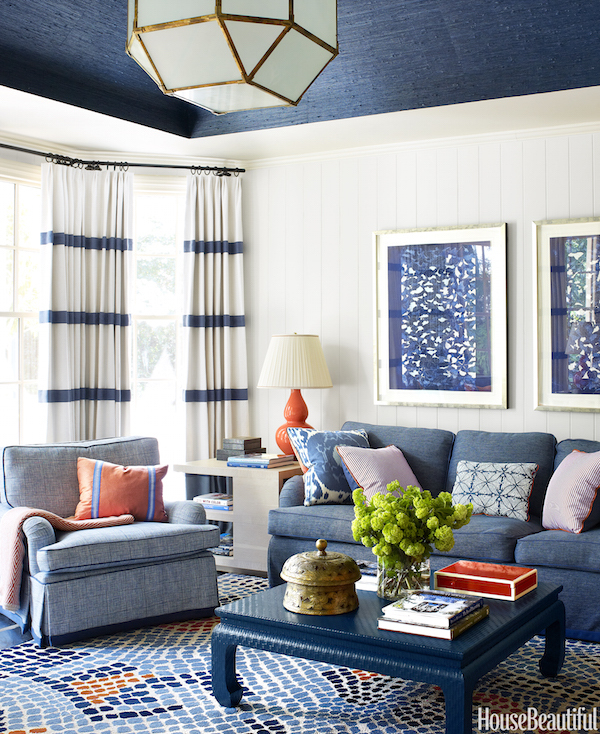 With bold pattern and unabashed use of saturated hues, she has transformed a young family’s large house in Charlotte, North Carolina into a stylish, comfortable abode, perfect for the magazine’s annual color issue. The statement-making entry offers a glamorous yet grounded welcome. The bold pattern of Jim Thompson’s Duquetterie linen is balanced with the geometry of Phillip Jeffries’ Rivets wall covering in the back, which in turn echoes the gold tones of the fabric, Bunny Williams’ classic Hourglass table and a custom light fixture. And practice has paid off in the family room where blue and orange (a color combo we’re particularly fond of in these parts) collaborate for a fresh foundation. A custom rug from Niba (more about them here) establishes the palette echoed by Jane Churchill’s Crispin on the Sofa and Ferrick Mason’s Lucas Check on the club chair. Christopher Spitzmiller’s Aurora lamp and accessories pull in the orange accents. And yet again, the fifth wall is brought into the scheme as Ralph Lauren’s Ionian Sea Linen wallcovering adds color and texture to the ceiling as Circa’s Morris Lantern contributes a sculptural presence. And for a budget friendly accommodation, Lindsey used three affordable linens for the voluminous curtains, which her workroom then sewed together with bold strips of blue – big bang for the buck! And while the front entry offers grown up glamour, the back entrance is an exercise in fabulous practical chic. 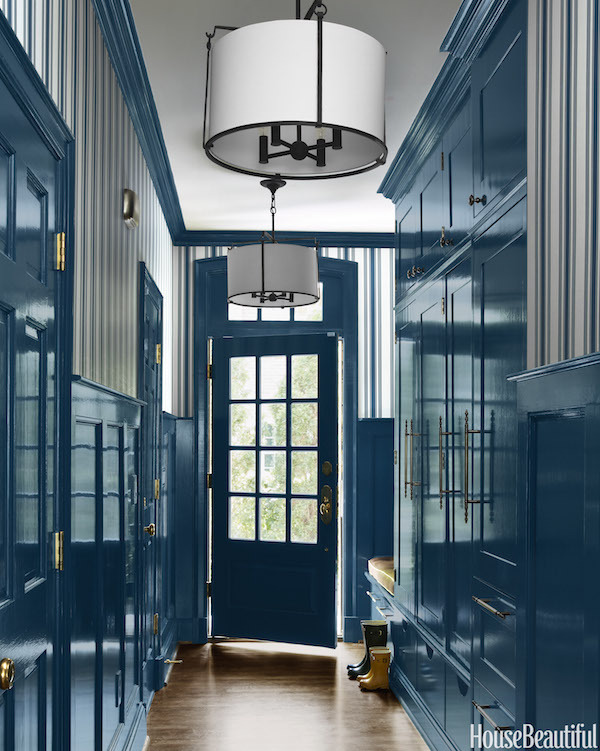 Brilliant blue lacquer in Benjamin Moore’s Twilight unifies the doors and cubbies of a hallway mudroom, providing wipe off ease from little hands. And Farrow and Ball’s Tented Stripe offers some stylish pattern above the height line. Lindsey shows us it’s all in the mix and to see how she worked her magic in the other rooms, you can see the entire project on the House Beautiful site. I am looking forward to seeing the other colorful entries in the issue. Yellow seems to springing up everywhere and this cover proffers hope that spring may indeed be not too far away. This entry posted in furniture, interior design, lighting. 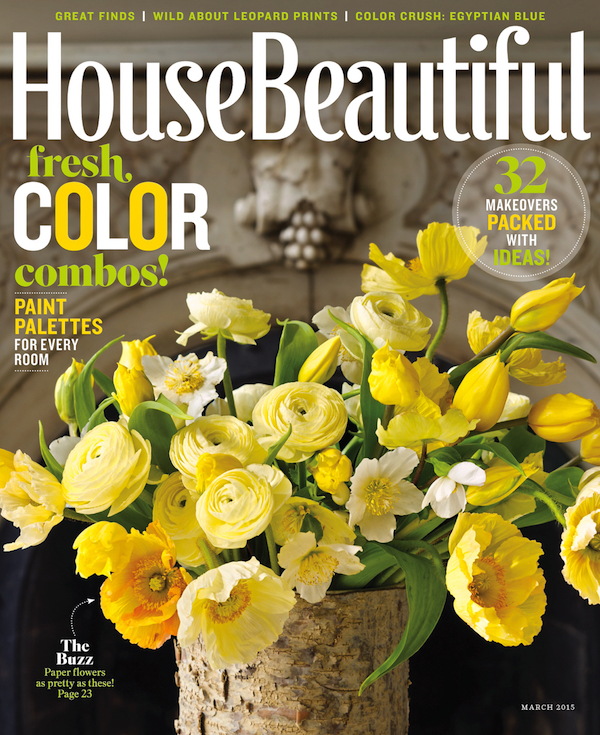 Entry Tags: color, House Beautiful, House Beautiful color issue, interior design, Lindsey Coral Harper Bookmark the permalink. Amazing spaces! Lindsey clearly has a very sophisticated color sense and it all seems really fresh (even a little edgy) but still livable. The only thing that freaks me out a little are the books that were so obviously chosen for their jacket covers. Looking at my copious collection and not seeing a single purple or fuchsia cover. Totally in love with her style! Power to COLOR! Wonderful to see color, especially this time of year! I think I know where your appreciation of the blue and orange pairing comes from, perhaps a beloved summer camp on a sheltered summer cove of Sebago? A flood of wonderful memories is unlocked for me when I see blue and orange together. I LOVE Lindsay’s work!! So fun to see her latest project. 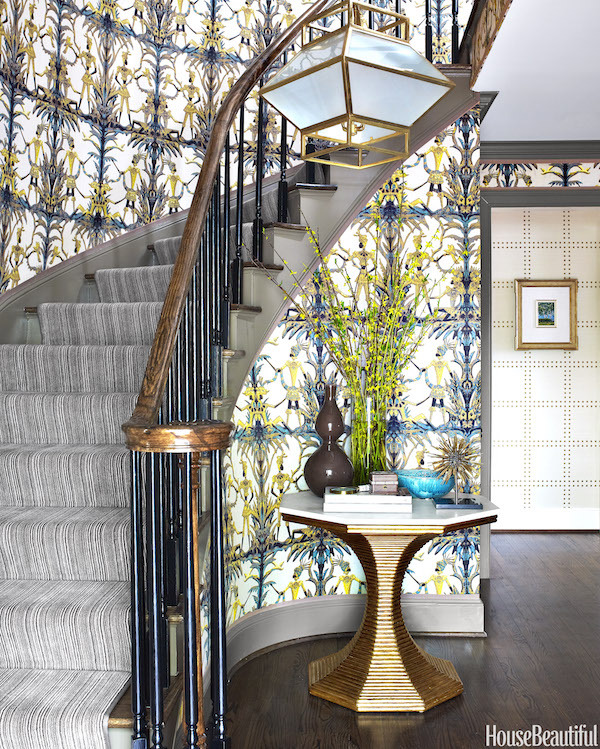 That lacquered hallway is EVERYTHING. What a wonderful piece to read. I love reading about talented designers that showcase their work about bringing homes to life with brilliant color & design! I love the blue, square textured table in the third picture. Would you know where I could find it? 81 queries in 0.666 seconds.